(a) The structure of the foldable AMOLED display. (b) The display folded at 180°. Image credit: Kwon, et al. ©2011 American Institute of Physics. 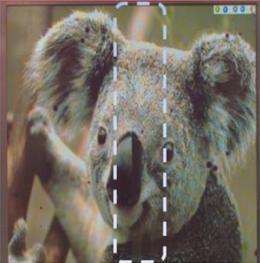 (PhysOrg.com) -- One of the most difficult problems for designing mobile devices is finding a way to minimize the size of the device while simultaneously maximizing the size of the display. To get the best of both worlds, researchers from the Samsung Advanced Institute of Technology in South Korea have designed and built a prototype of a seamless foldable display that folds in half without a visible crease in the middle. As the researchers explain in their study, which is published in a recent issue of Applied Physics Letters, recently there has been a great deal of interest in flexible, extendable displays. Most of these flexible displays are bendable or rollable. Fabricating a display that can fold completely in half would have the advantage of providing a large screen in a small, portable form, but so far it has been a challenge to eliminate the visible crease between panels. In the new study, the researchers have overcome this problem, demonstrating a seamless foldable active matrix organic-light-emitting-diode (AMOLED) display with no visible crease. The display consists of two AMOLED panels, silicone rubber (a hyperelastic material), a protective glass cover, and a module case. The display has a very small folding radius of just 1 mm, so that one panel lies almost completely on top of the other when the display is folded at a 180° angle. Also, the glass cover not only prevents scratches, but can serve as a touch screen, as well. The researchers tested the foldable displays mechanical and optical robustness by performing 100,000 folding-unfolding cycles, and found that the relative brightness at the junction decreased by just 6%. Since this difference is hardly recognizable by the human eye, the deterioration is considered negligible. As the researchers explained, the key to making a display with no visible crease involved controlling the optical properties of the materials. 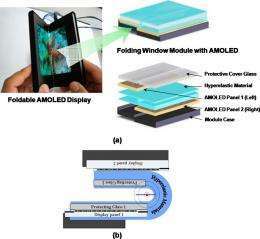 All the materials in a foldable window unit (glasses and silicone rubber) must have almost the same optical properties and attach to each other strongly without any optical property change, coauthor HongShik Shim of the Samsung Advanced Institute of Technology told PhysOrg.com. The foldable AMOLED display without a visible crease. Image credit: Kwon, et al. ©2011 American Institute of Physics. As for applications, a foldable display could be useful in a wide variety of small, mobile devices, such as mobile games, cellular phones, tablet PCs, and notebook PCs. The hyperelastic silicone rubber is commercially available, which could make it suitable for mass production. In addition, the researchers plan to investigate applying this design to fabricate large-size flexible displays. So build a flexible display already. This is the 10th one this month. One a less pessimistic note, using rubber-silicone rather than plastic actually seems like a really good idea as it's far less prone to creasing and cracking. It's sort of like soft rubber but much more durable. This is the same stuff in the rubber-silicone cookware that you can throw in the oven, or the potholder thingies that are all rubbery. Didn't "they" supposedly find something with similar properties at the Roswell "crash site"? I don't know if you're being funny or if you're a ridiculous fanboy, but I'll give you five stars anyways for the optimism. I forget which company is putting out a folding, two-screen slate to compete with ipad, but this tech would be perfect for it. yes it was called mylar, used to reflect radar - It so much bugs me that people still want to belive we have been visited by aliens, THE DISTANCES ARE TO FAR. Modernmystic - It so much bugs me that people still want to belive we have been visited by aliens, THE DISTANCES ARE TO FAR. Just because we don't (currently) have the knowledge or technology to travel vast interstellar space faster than light, does not mean that other civilizations have not already developed the technology to do so. Our civilization has existed only about a fraction of a second on the universal timescale. It does not make sense that we are the only currently living spacefaring civilization. And we haven't even gone outside our own solar system yet. If aliens exist, why wouldn't they be interested in us? True, we probably don't have any technology that would be of interest to them, but think of them as anthropologists and scientists. We are a lesser species to them, just as we consider ants to be lesser species. Despite the fact that ants are highly organized and intelligent in their own right. Mylar is a DuPont trade name for a type of polyester, and as mentioned we didn't need any aliens to bring it to us. We used mylar tape (with holes in it - representing 1's and lack of a hole representing 0's and another hole representing a parity bit) in our missle fire control computer back in the 70's on my Sub (SSBN 630-G). Production started in the early 40's based on work in the 1930's - predating the supposed alien visit at Roswell NM.